By collecting 100 per cent of water revenue, we can help local communities keep their water resources maintained forever. Eseye, its global IOT network, and the AWS Cloud ensures that eWATER always sends and receives data when we need it, and at a cost-effective price. eWATER is a London-based startup with a mission to provide an affordable, sustainable solution that helps the world’s poorest populations access clean water supplies using simple hardware devices at water taps, the power of IoT and cloud-based monitoring, and a low-cost way for people to pay for the water they use at the source. eWATER set out to solve a major challenge that vexes the health and economic well-being of people in developing nations: access to clean water. It’s estimated that more than 780 million people across the globe do not have access to clean water, with some 2,300 people dying each day from illnesses contracted by drinking from dirty, disease-ridden water supplies. While government agencies and individuals have provided large sums of money for water systems, there is often little or no money devoted to local, ongoing maintenance of water-delivery infrastructures. So the systems break down, and people go back to obtaining water from contaminated sources. eWATER’s founders saw a solution in the wide use of cell phones, which are now omnipresent in even the poorest countries. They reasoned that if people were willing to pay small sums for cellular service, they would also be willing to pay small amounts for clean water at the tap, provided that the money collected would go towards reliable maintenance of the water systems. Their solution involved several technology components, including small, tamper-proof devices installed at water pumps to control access to and collect usage information at each tap, and a data-delivery system that could send information from each pump to a central location for monitoring and to alert technicians when a tap is not working. To make this work, eWATER also needed secure, reliable machine-to-machine (M2M) connectivity that could send and store data in the cloud. Additionally, eWATER wanted a scalable, cost-effective way to increase data processing power and data storage to scale its solution across many countries. With the grant support of the GSMA Mobile for Development Utilities Innovation Fund, eWATER, which is an Amazon Web Services customer, turned to Eseye, an AWS Partner Network (APN) Advanced Technology Partner, to help implement the solution, starting with pilot projects in Gambia and Tanzania. The solution starts with solar-powered, IoT-enabled pumps that work with filtration systems, water storage tanks, and village water distribution systems. Eseye AnyNet Secure SIM smart cards in the pumps can access up to 440 global cellular networks, ensuring that the SIMs have highly available cell connectivity for sending data about each pump’s daily usage and condition to the AWS Cloud. 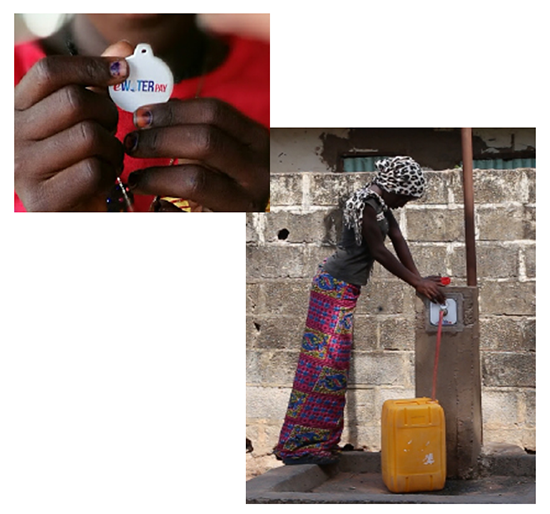 Local residents access water at village taps using NFC (near-field communication) tags. First, the tags are pressed against cell phones running an eWATER app that is used to purchase water credits; if an individual does not have a cell phone, they can usually find a village merchant who does and who can provide access to the app. After credits for water use are wirelessly transferred to the NFC tag, it is then pressed against a water tap containing an eWATER device. This opens a valve that delivers the purchased amount of clean, fresh water. To ensure the taps are working and maintained, the IoT devices at each tap connect over the cell networks to a cloud-based eWATERcare application, which receives information on functionality, flow rates, and sales in real time. In addition to daily usage, this helps quickly identify unusual behaviors or conditions. The information is then sent to local maintenance franchisees. As eWATER scales up the use of the eWATER system throughout other sub-Saharan countries, including Nigeria, Uganda, Ghana, and Senegal, the company harnesses the skills of unemployed young people by helping them to set up eWATER installation and maintenance franchises. The local franchisees are responsible for ensuring full customer satisfaction with the eWATER service, and that the operation and maintenance of pumps is performed by local skilled technicians who are trained to meet Service Level Agreement targets. This process has been approved by water ministries and donors across the globe because it reflects the economic and financial realities of delivering clean water to rural and poor communities. eWATER provides NFC tags that can be loaded with water-use credits from an eWATER smartphone app. The user then presses the tag against a water tap containing eWATER hardware, which releases an amount of water matching what the user purchased. The initial projects by eWATER and Eseye using the IoT solution and AWS Cloud capabilities helped successfully deliver clean water on a 24/7 basis to about 13,000 people in Gambia and Tanzania. The solution provides strong data security through the Eseye AnyNet Secure SIM technology, highly available wireless connections, scalable cloud storage and processing for pump-based data, and cost-effective pricing. It also lets eWATER operate and scale the solution on a pay-as-you-go basis. The company forecasts that the solution may be accessible to as many as 10 million people over the next five years through the instillation of 100,000 more taps. Eseye is an AWS Partner Network Advanced Technology Partner that specializes in simplifying global IoT device deployments with unique zero-touch, highly secure, remote device provisioning and the freedom to roam across a vast number of international Mobile Network Operator partnerships. The company’s managed, global cellular network reduces the cost and risk of IoT deployments while connecting the AWS Cloud to 2G, 3G, 4G LTE & CDMA devices with a single AnyNet Secure SIM in more than 145 countries. Learn more about running IoT solutions on AWS.